This guide contains all information and instructions you need to work with the Extension website as well as tips and tricks for advanced users. For those of you who are already familiar with the site or just need a quick refresher, it includes several quick start reference documents. We welcome questions and feedback and hope that this will serve as a valuable resource to Extension employees who work on the website. Over the last months, as you scroll down our digital strategy blog, we have shared various tips for managing content on the Extension website. Let’s revisit these to see what may be worth using in upcoming quarters. Did you know most fields you need to fill in when adding content on the Extension site are searchable? Just place your cursor in the select field and start typing. A list will pop up to select from, such as the name of the county or a list of OSU authors. Keywords allow content to show higher in search results, and help you and visitors to narrow down the results too. You can add them using these keyword guidelines. For content that doesn’t use keywords (e.g. program resources, events), any important words that someone may want to search on to find the content should be somewhere in the text or title. When you see a Program Resource list you want to reorder, click on the pencil icon that appears next to the list’s title and select “reorder items”. If you are hosting a virtual event or webinar, you can now select “online only” as the location. If your event is the same time and location on several different days, then you can mark the “event occurs multiple times in a specified period” checkbox to only have to enter it once. The Equal Opportunity and Accessibility statement is already on every page of the Extension website linked in the footer, so you only need to add it to downloadable documents on the website. For best results when posting applications (such as for Master Gardener trainings), add the application’s file or link as a “program resource” that displays on a “How to Join” sub-page. Then create an announcement that references that program resource or the page itself. When you save a piece of content, you can enter a “Revision log message” to describe the changes you made or why you made them. These messages get displayed in the content’s Revisions tab. A simple way to add new content to the website could be taking a newsletter or blog piece you have written recently and turning that into an article useful for your audiences. Is there a suggestion that has worked well for you? Share it with our web team. The Division of Outreach and Engagement is excited to welcome Mark Kindred in our newly established Salesforce developer position. Mark comes to O&E from our cousins in Ecampus where he served as a multimedia developer. His specialty was database and web app development. Prior to arriving at OSU in 2013, Mark was an entrepreneur running a consulting agency with clients in five states. In all of these professional roles, the time spent connecting with the people who are clients/stakeholders was among the most rewarding aspects of performing the work at hand. With a life that has included stints in Maryland, Alaska, Texas, and his standout favorite, Oregon, Mark’s enjoyment of unique, new places means he will enjoy the process of learning about your corner of Oregon as the role takes shape. Mark will be working with Lucas Turpin and O&E Leadership to begin the needs assessment and alignment phase of our Customer Relationship Management implementation across O&E. During this time, don’t expect to see a lot of changes as 90% of this work will be planning to ensure our implementation aligns with the business needs of your units and the long term strategy of the university. The team looks forward to talking with you about how CRM is aligned with your work and can provide new benefits to you. For this week’s post, we thought we’d start the year with a couple of tips that can save you time and frustration. Did you know most select lists on the Extension site are searchable? Just place your cursor in the select field and start typing and select. You are creating an event and want to tag additional counties. Just place your cursor in the select field and start typing. 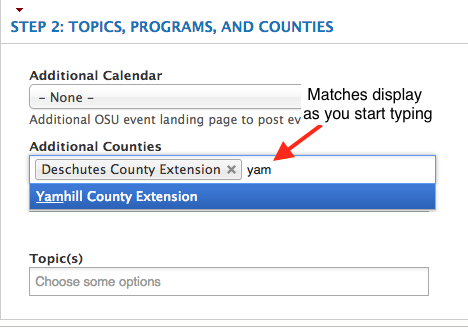 As you type, matches will start to appear, once you find the county you are looking for, select it by clicking it. This technique is especially helpful for selecting items from long lists, like topics. A common situation we come across is the need to link to documents which change often or yearly, such as a registration form. Box is a great solution for this. After uploading a document, copy the URL (web address), then use the URL for creating a program or online resource, or link to the document on a subpage. 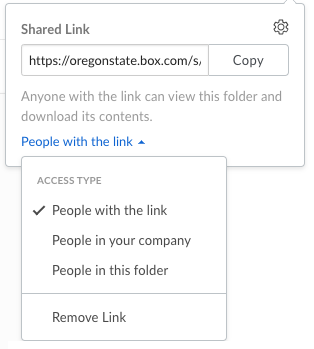 See the Box section on our File Management guide for more information.The file can be set as private (only a select list of people can access it), viewable for anyone at OSU (requires ONID authentication), or anyone with the link can access it. Once you have created the link, you can modify the file, even replace the file with the current version. Your link on your page will always work and return the latest version of the file. Let’s say you are a 4-H agent in Morrow County and you need to post a form for Morrow County 4-H website. By uploading the form to Box, you can replace the file each year without changing the link on your website. Then if someone has the link from last year, you can be assured that everyone is accessing this years form. Added benefit — if the form shows up in a Google search, the link will go to the current version, not last years, or the 2012 version. New to Box? Visit the Getting Started with Box page or contact Victor Villegas for personalized help. New Look to Program Pages Coming Soon! If you are new to working on the Extension website, or need a refresher, then here are some getting started tips and answers to frequently asked questions. Hopefully, it will help avoid common missteps when still learning the new website structure. How you add content to the website is less based on where you are located and more on your role. In the previous website, you entered things on your county site. Now you enter information together with your group (see Who is going to enter all this content?). Every group can add an event or newsletter. Whoever creates the newsletter, must continue to be the group that uploads subsequent issues (which show up automatically on the newsletter page). EESC uploads any catalog publications to the site so your group doesn’t have to. If a catalog is not on the site, then it’s probably been pulled to be updated. You can see who uploaded a certain piece of content and in what group by going to All Content Overview. There is also a link to this on the My Groups menu page when logged in, just in case you forget. Any member of a group can make a change to the group’s content, but contact the author, if reachable, about changes. If you see something that should be unpublished until it can be further reviewed, contact EESC. When mentioning an Extension faculty or staff person on a webpage, just hyperlink their name to their profile page. This way if their contact information ever changes it only has to be updated there and not all around the site. Adding someone as an author to an article (step 3 of edit screen) creates this link too. If the content relates to more than one topic, then it can be tagged with all topics to display many places. This way people can find information in the topic they are searching on, but be careful about not over-tagging (it needs to be relevant). Content Teams can get confused about an Article vs. Educational Document so a good table that helps you to see the difference is in the content team guide “Deciding the Type of Content”. Also see File Management and Getting Content Organized on the Website. Program Groups have the useful function of tagging a program resource with a category. Then, it appears automatically with a title and description on a page with the same category selected in its Program Resource List (which you can see in the page’s edit screen). This way you don’t need to hyperlink to the program resource. Office Groups subpages, which are the side menus on county office pages, are meant to describe the physical location and facilities and serve as a landing spot for local relationships (i.e. a place to direct people on the website to find staff, events, or newsletters). They can also be pointers (e.g. orange button links) in this transition period for people to know where to find things, especially as educational content is now on topic pages instead. See the FAQs and the Training page of this blog to learn more specific answers or to questions that may come up for you farther down the road. And of course, always feel free to email our web support team. Do you have annual research reports and not sure where these should go? What about a journal article published outside OSU? Or a weekly alert that comes from your research? We have some answers to guide you in knowing whether or not this research content should go on the Extension website and next steps based on that decision. On November 1, the archived county sites go away so if your content team hasn’t reviewed the content to see if there’s anything to update and move over, then it’s still easy enough to do in the next weeks. After that, it becomes harder once the server is taken down and the content files are backed-up in Box folders. This decision flowchart can help in deciding what to do with research focused articles. Here’s an example of a project with research listed. This FAQ addresses fair use of externally published research articles, which are added as “online resources” to the website. These collections in the OSU Scholars Archive are set up for archived content from agricultural experiment stations, if you want to submit older research reports there. An instructional webinar recording for faculty/staff at combined stations shows how to enter content in the Extension website and how content teams differ from the office group in what, where, and how content is entered. If you have further questions or suggestions related to research or archived content, please contact the EESC web team for more information and discussion.